The house is located between the Norma Church and the Norma School, and back in 1960's and 1970's was occupied by a Mr. Ova Low (10 Jun 1889-18 Sep 1973), a brother to Holly Lowe, from Smokey Junction area. Ova's wife, Ada Pearl (ADKINS) Low, was born on 27 Mar 1899 and passed away 16 Nov 1937. Ova's sister, Teshie (LOWE) Kagley, used to live in a small building next to the house or maybe in the same house, I can't remember. 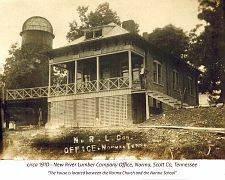 What we all call the Ova Lowe House, was really the “Office Building” for the Band Mill that was located in back of the Office Building (Ova Lowe House). 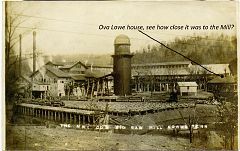 Ova Lowe bought the Pond and the old Mill that was in back of the office building, and some land back of the Mill toward the Church, up the Creek too, including the barn which belonged to the Lumber Company. Some of the Old Mill Building was still standing and had a lot of the old casting (Iron) in it. Before WWII, Japan was buying “scrap iron” in the U.S. and times was really bad and everybody was selling all the “scrap iron” they could find. Trucks was going around the county hunting junk. Ova Lowe had a lot of buyers come visit him wanting to buy what he had in the old Mill. He would not sell it. He would tell them that all of it is going to Japan and they will be shooting it back at us someday. When the War started he sold all of it (for our use) and tore down what was standing of the old Mill building.